I use these voltage sensors to monitor a battery pack used to power an Arduino. They are nothing more than two resistors wired as a voltage divider, but at less than £1 on eBay they are easy to use. 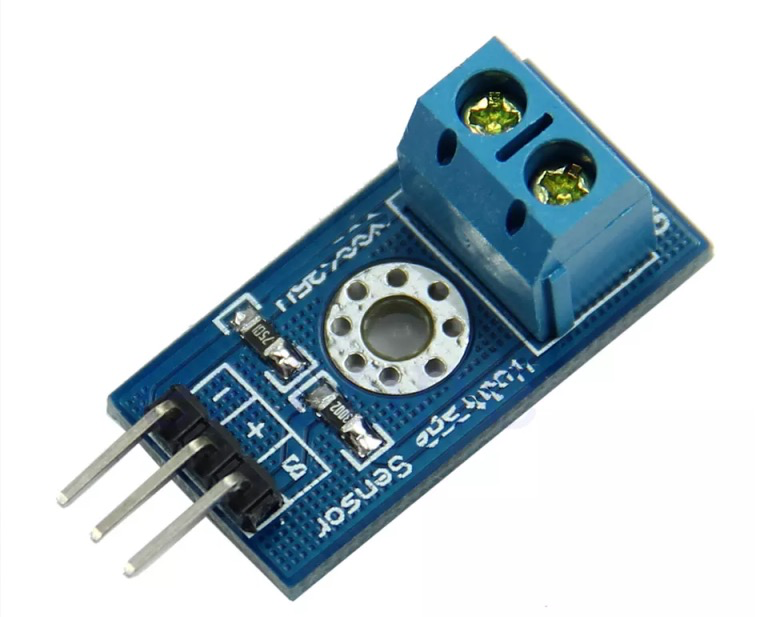 The Arduino Analogue inputs can take a voltage of up to 5 volts, these voltage sensors use a 5:1 voltage divider and this means that voltages up to 25 volts will be reduced to below 5 volts. All we have to do is measure the reduced voltage then multiply the result by 5 to get the original voltage. This means you can power the Arduino with a 9 volt battery and monitor the battery voltage. The sketch shown below is a simple example of how voltage can be measured. Take care, there is no reverse protection, so if you connect the voltage incorrectly it may damage the Arduino. Make sure the voltage you are measuring is less than 25 volts. Two factors effect the accuracy of the result. The sketch assumes the Arduino’s Vcc is 5 volts, check this with a volt meter and adjust the variable Vcc accordingly. The second factor is the actual division provided by the voltage divider. The voltage shield shown at the top of the page has a factor of 4.092. If you build your own divider from two resistors, I used 15k and 3k3, then calculate the factor by adding the two resistors together and dividing the result by the smallest value resistor. // NO REVERSE PROTECTION. Make sure its wired up correctly!!! Author rydepierPosted on April 30, 2015 April 30, 2015 Categories ArduinoTags arduino, voltage sensorLeave a comment on Voltage sensor for Arduino. The electronic package for my weather balloon project is now complete and housed in a lightweight plastic cage. I have reduced heating problems by using 25 cm male to female USB connectors to connect the LPRS radio and the GPS/FTDI to the Raspberry Pi, now the 4 way USB block runs at a reasonable temperature. I can monitor the internal temperature of the LPRS radio and the ambient temperature, but I was concerned that in the cramped conditions in the container the Broadcom chip may overheat. Early experiments with the Pi in a case and all four USB sockets used showed that the system would behave erratically as the temperature rose above 30C. My Python code sends ACK after each requested data has been sent back to the master unit and I intend to add the Broadcom temperature to this monitor the Raspberry Pi. temperature will then contain the value. It seems the Broadcom processor runs at about 40 to 50’C, but could operate up to about 80’C. Direct digital synthesizer is a type of frequency synthesizer used for creating arbitrary waveforms from a single, fixed-frequency source. The AD9850 is a low cost device that can produce sine waves up to 125 mHz and the output frequency is set digitally using an MCU, such as an Arduino. In addition to Gnd and 5 volts only four connections are required and these are shown in the sketch below. When I first obtained this device I could find very little information, but eventually came across this sketch. I quickly got it up and running and the picture shows an oscilloscope trace taken from the output Sine A. #define RESET 11 // Pin 11 - connect to reset pin (RST). answering Y when required. Once Gnuplot is installed the following python programme can be used to generate some data. It is possible to change axis, add titles and much more. A good guide as to what can be achieved with Gnuplot can be found here. The humidity sensor, DHT 11, is the last sensor to be added to my Weather Balloon project. The board I am using is shown above, a resisistor is already connected between Vcc and the Output and so only three connections, Vcc, Output and Gnd are required. The sensor will operate at 3 volts as long as the connections are kept short. Where 11 is the sensors number (use 22 for the DHT22) and 4 is the GPIO pin used. The DHT11 is connected to pin 7 (Output), pin 17 (3.3 volts) and pin 20 (Gnd). The code can now be run from within a python programme. I intend to use this board in an NBTV project to measure the speed of the Nipkow disk. This is normally done by having slots cut in the disk and shining an IR LED through to be picked up by a photo diode on the other side. The connections (looking down on the board with the connections at the bottom) are Gnd, Analog Output, Digital Output and Vcc. I have used a slightly modified sketch that I used with an LDR shield. Arduino Analog Pins A0 and A3 are set as Digital Output Pins to provide the power supply. Pin A1 is set as a Digital Input and pin A2 is set as an Analog Input. Upload the sketch, then remove the power, connect the shield as shown in the picture above and reconnect the power and the PWR LED will light. Use a piece of card to interrupt the beam, the Output LED will turn Off and On, the Serial Monitor Output is shown here. When the beam is broken the Output goes High and the OUT LED lights up. When using this as a Tachometer the Digital output would normally be used. Here is the sketch I used to test the board, but before using it make sure your connections are the same as mine. The picture shows the Compass connected to an Arduino Uno. The compass uses a four pin socket, I cut the plug off the other end and soldered a four pin header plug instead. This board must only be powered with 3.3 volts and the data lines must also be connected to the Arduino via a 5volts to 3.3 volts logic level converter. I use one I obtained from Hobbytronics here that has a 250ma 3volt regulator that can power the GPS board. The bearing will only be true if the Compass chip faces up, this will mean that the Ceramic Active Aerial will be facing downwards. If the board is turned so that the Aerial faces upwards (the correct position) the compass reading will be wrong. The Adafruit article shows how this can be corrected. Keep the compass level and rotate the board to see the heading change. On my board the direction for the bearing seemed to be the board edge with the GPS socket. This edge should face forward when mounted in a vehicle. Testing the GPS: I disconnected the HMC8553L plug and connected the six pin GPS plug. Only four pins are connected and these are in exactly the same order as on the Ublox NEO 6 board, Gnd, Tx, Rx and Vcc (Gnd is closest to the GPS component. I used the Adafruit GPS library from here. Copy the library to your Arduino Library folder and restart the Arduino IDE. Use a 5 volt to 3.3 volt Logic Level Converter, this board cannot be used with 5 volts. Connect Gnd and 5 volts from the Arduino to the Logic Level Converter, the Adafruit sketch uses Software Serial on pins 2 and 3. The GPS Rx pin is connected to pin 2 and the GPS Tx pin is connected to the Arduino pin 3 (through the Logic Level Converter). The GPS is powered from the Gnd and 3.3 volt pins on the Logic Level Converter, this time the board’s power LED will light. Open the Example folder and upload the Echo Sketch this simply prints the output from the GPS on the Serial Monitor and is useful because even without a signal the GPS will output data and so the board can be tested indoors. Outside the GPS acquired a first time fix in less than two minutes. The next task is to get the board running on the Raspberry Pi and to be able to read both the GPS and Compass at the same time.